Lovely bike route with great vistas through the towns of Grisì, Camporeale and San Cipirello in Sicily, through the hilly hinterland. The first climb is tough, so if you’d prefer easier climbs, we advise you to choose bike route L3. Go from the Eni gas station in the direction of Partinico and Alcamo (SP17). At the end of the road go left in the direction of Partinico (SS113). Take the exit for Grisì and follow this road until you reach this small mountain village. This climb starts of easy, but becomes rather steep at the 15 km mark. When you arrive in the town of Grisì, turn right on the Via Napoli and at the end of this small descent turn left on the Via Cesare Gaglio. Follow this road, which will lead you out of the town. 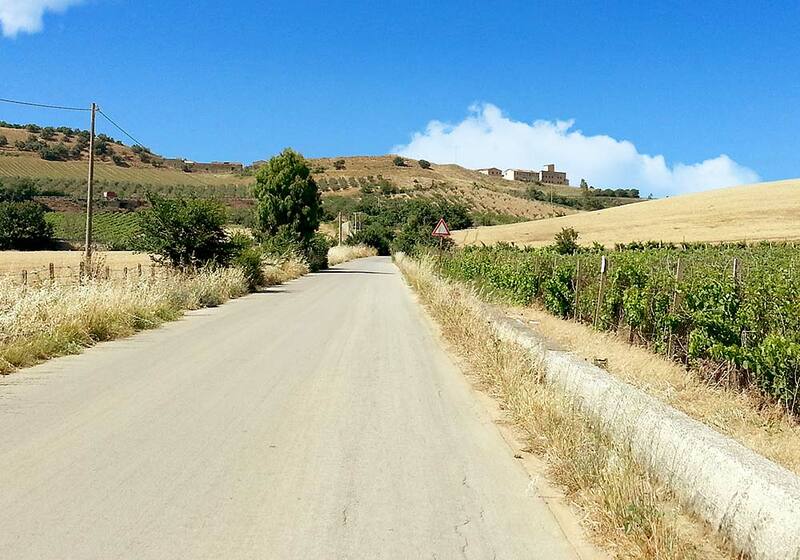 Keep following the road (descent) and at the end (at 400 meters) turn right in the direction of Camporeale and Alcamo. At the end of this road turn left in the direction of Camporeale. This is where the second climb of the route begins. When you reach the roundabout, you can either go straight ahead (this option is shown on the maps below) or you can go left. The last option is less steep (straight ahead means a descent of around 23°!) and you’ll end up at the same point, which is Via Calvario – Via L. Caruso – Via Roma – Corso Umberto I, all parts of the same long street with passes through the town of Camporeale. At the end of the descent turn left (sharp turn!) in the direction of Palermo and San Cipirello. Go straight ahead and follow the Via Principe di Camporeale which leads you out of Camporeale. Follow the road (Contrada Signorino – Contrada Serpe) until you see a large tree in the middle of a fork in the road. Turn left here (SP20) in the direction of San Cipirello. Close to San Cipirello at another fork in the road, turn right in the direction of this town. Here, a short climb begins (5-6%). When you reach San Cipirello, turn left on the Viale Enrico Berlinguer (SP2). You need to follow this road all the way back to Partinico (passing Lago Poma). When you’ve arrived in Partinico, go underneath the SS186 and immediately turn right in the direction of Palermo and Trapani. This will lead you to the roundabout, where you need to go left in the direction of Balestrate (SS113). Follow this road and turn right at the exit for Balestrate. Follow this road, the SP17, until you see the Eni gas station on your right.